Are you ready for this week’s dose of red, black and white? I have quite a good selection of colors with which to work here in Santa Cruz. None of the colors go by fancy names. They are pretty much the basic tones. Therefore, when someone asked me to pass them the “chartreuse” yarn for their weft in one of my workshops, I had no idea what they were talking about. Here, we get dark green and light green. But, I have to say that there are enough colors here to keep me happy. Why then do I keep being drawn to black? I guess there is just something so clean and sharp about black and white. The third piece in my wall hanging series with the Wayuu-inspired design is an inch or so away from being finished. Naturally, as I have sat there these last few days picking up threads and heaving open the sheds, my thoughts have been turning to my next project. It will probably be a purple scarf decorated with supplementary wefts using cotton yarn from Guatemala and mostly silk supplementary wefts. 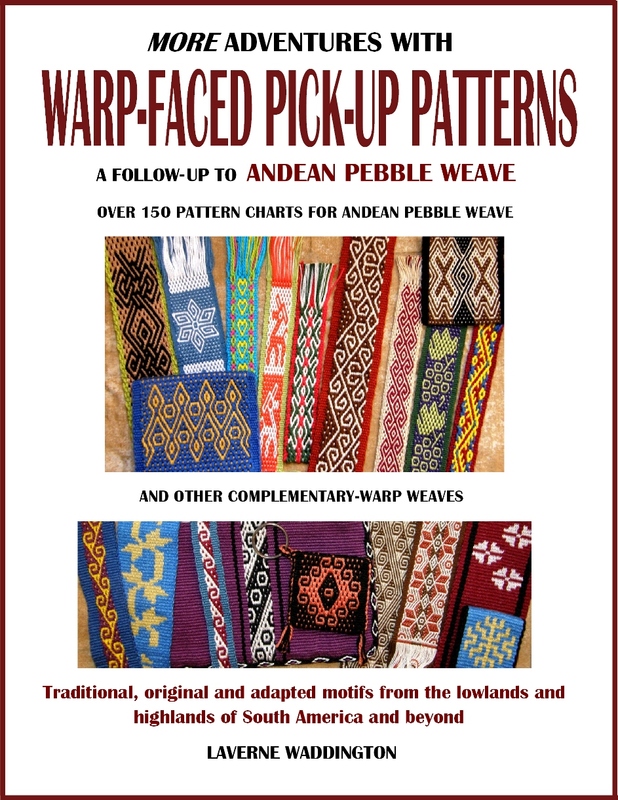 I am still planning the motifs and, while digging around at the book shelf, I unearthed a packet of patterns that was given to me by Sharon, a Weavolution weaving buddy, a year ago. 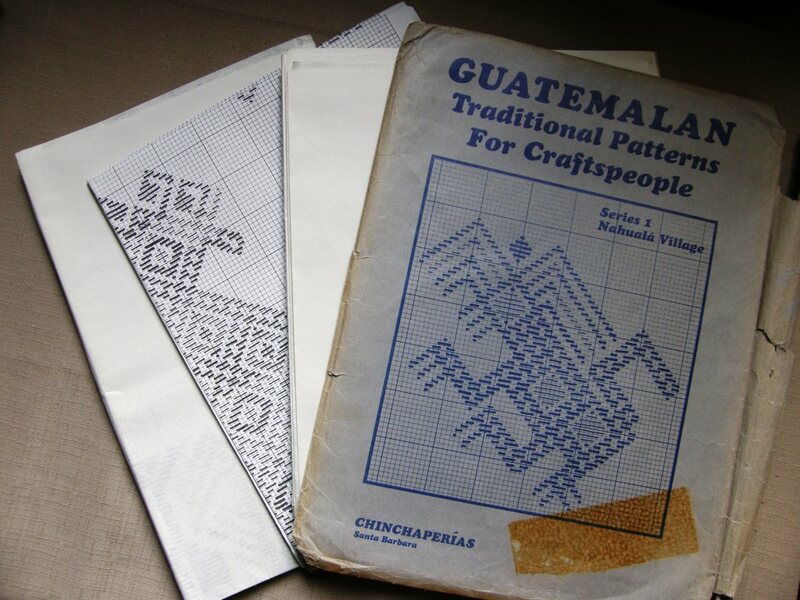 The packet contains three enormous sheets of detailed Guatemalan motifs. The front of the envelope states that this is Series 1 from Nahualá Village. 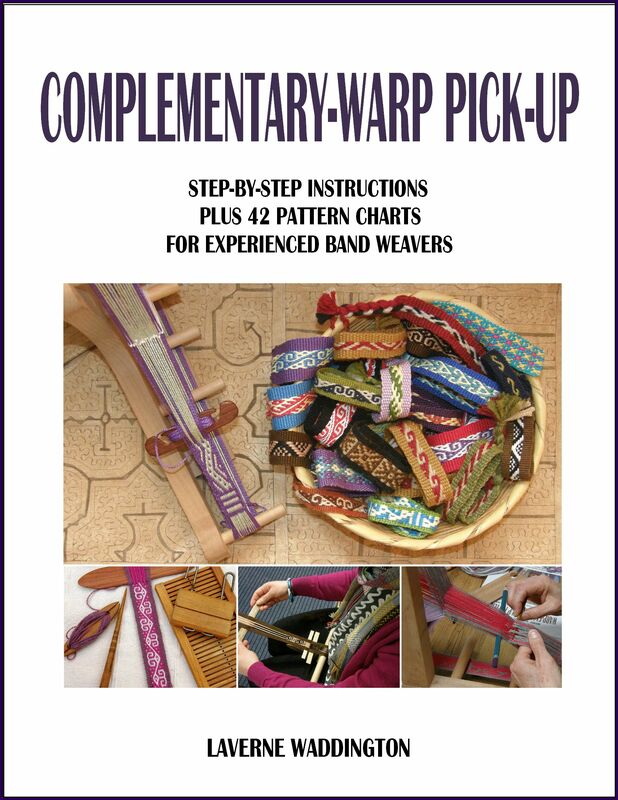 Nothing on the packet or within indicates when these patterns were charted, by whom or how many packets comprise the entire set. Imagine if this person or people graphed patterns from dozens of villages! Happily I tracked down another packet, series 3, on Ebay and it seems that there is a weaving guild that may have some others in their library. 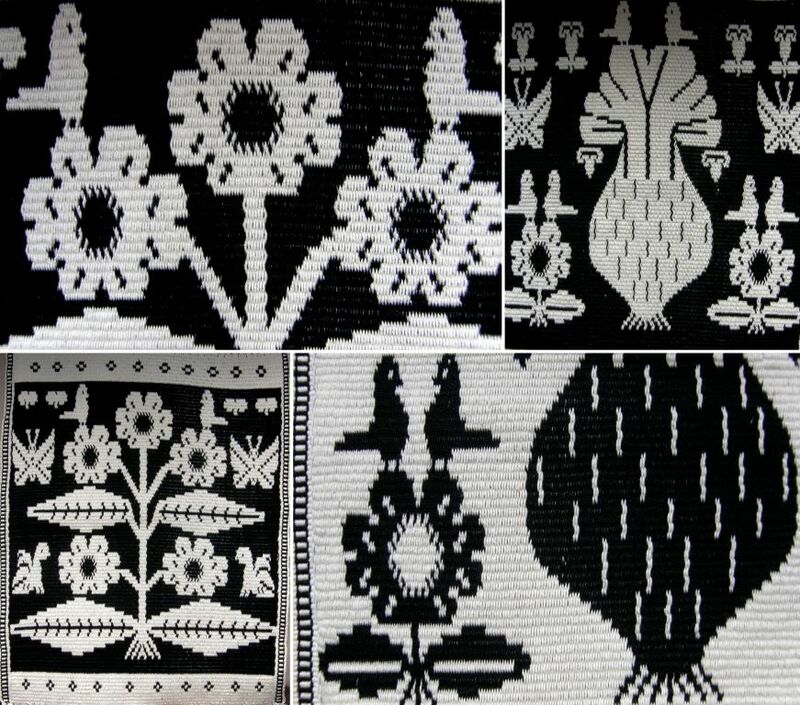 However, I probably won’t use any of these motifs for my scarf. I have something quite specific in mind that I learned when I was studying in Guatemala but which also has a slight Bhutanese influence. I told you about circular and dovetail warps last week and I have decided that I will make a circular one for my scarf. That will keep me in good foot-bracing distance from my bed. 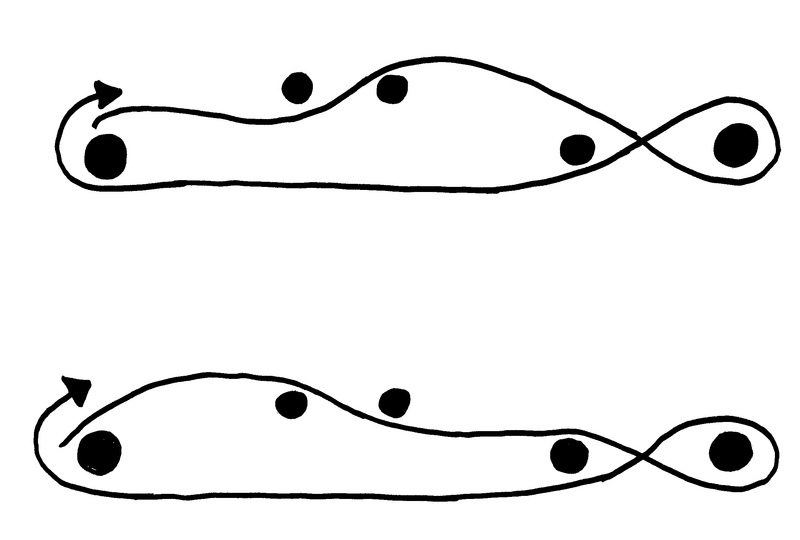 Winding a circular warp is straightforward enough. I was easily able to make some changes to my standard warping board to make this work well. The extra unnecessary stake was incorporated so that I can try to learn more about the mysterious coil rod. So far, I have not seen a coil rod being used in Bolivia and Peru. The first place that I came across one being used was Ecuador. It was in the ikat- weaving town of Bulcay and I had no idea at the time what this piece of equipment was. There is a black arrow pointing to the coil rod in the above picture…the thin stick just below the upper beam. When I visited with this weaver, I was concentrating more on seeing how she prevented having the warps move out of alignment and excessively blur the ikat pattern. I suspected that the coil rod was her”secret weapon” but when I asked, she told me that it had nothing to do with it. Actually, I have to say that she was not very keen on answering my questions. Let’s face it…not everyone is fond of having strangers hang about pestering them with questions while they are trying to weave! She was nice enough to let me sit by and watch and take pictures. Dennis Penley, author of Paños de Gualaceo, writes that the coil rod, (he calls it a “rolling stick”) in Gualaceo, one of Bulcay’s neighboring communities, is added once the warp has been placed on the loom. He says that the warp threads are wound around the stick in bunches of ten. The stick serves to stop the warp threads from slipping. You can see how the warps have been grouped in the above photo and the way they are coiled about the stick at left. Of course, as time went by, I discovered that coil rods are used by many backstrap weavers who work with circular warps and I have since seen many examples of weavers in Asia using them. When I met and got to spend a little time with Burmese weaver Dar Ku in Massachusetts, I noticed the coil rod in her loom. 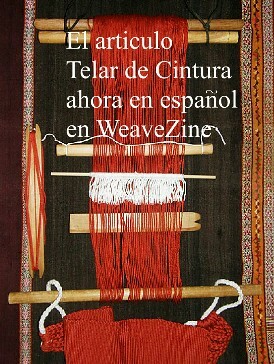 It is the rod furthest from the weaver in the picture. I didn’t think at the time to ask her if she added it after or during warping. I was concentrating more on her use of supplementary wefts to make her patterns and the fact that she was weaving her designs while looking at the wrong side of the cloth! Her heddle system was also very interesting. You see, there are just so many wonderful things to see and take in when you watch a backstrap weaver at work!…what is the shape of her sword, how does she open the heddles, how hard does she beat, what does she use to pick up her threads and much much more! 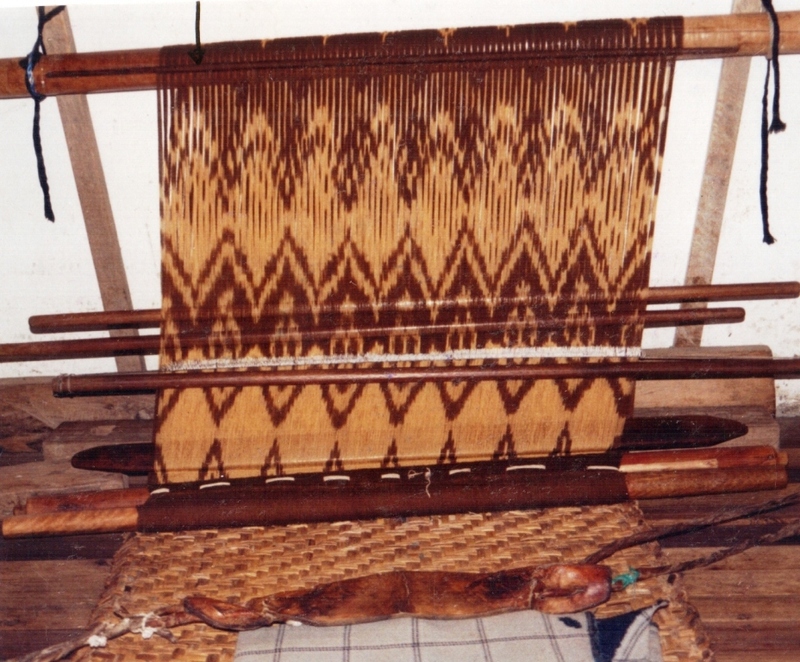 As she wasn’t weaving ikat and her warps could move without causing any harm, I assume that the function of the coil rod in this case is to help maintain width and keep the warps spread and in order in the potentially messy area beyond the heddles and shed rod. If you flip this upside down, you will see that my new warping set up was designed to resemble this. Stake C on Ju’s set-up separates the threads into two sheds. 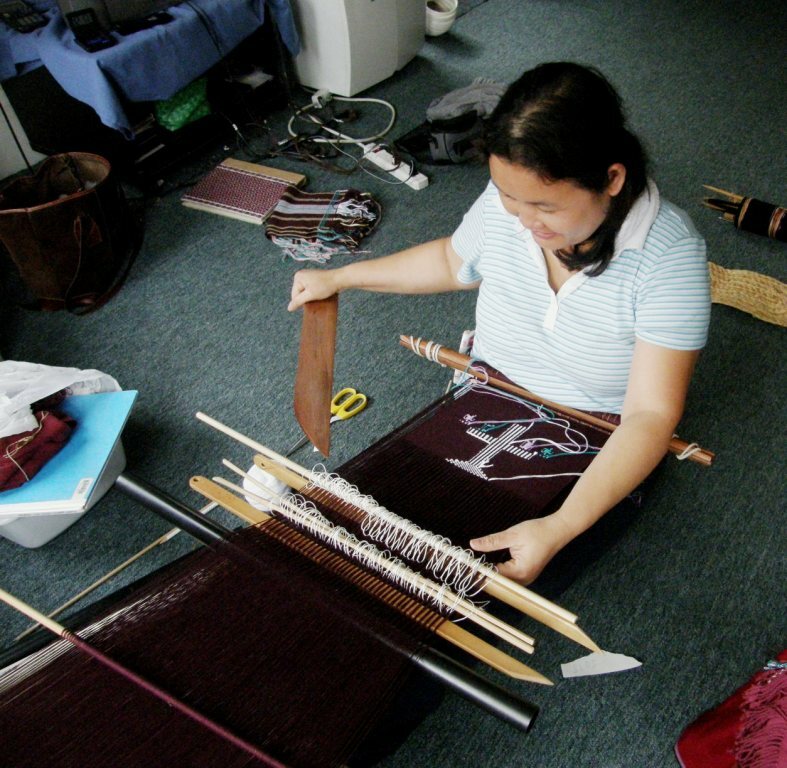 Stake D holds the heddles that Ju makes as she winds the warp. Stakes B and E will be replaced with the backstrap loom bars. Stake A will be replaced by the “curious” coil rod. As I am not going to make heddles as I go, stakes C and D on my set-up will hold the cross. From left to right…loom bar 1 will replace the first stake. The next two stakes will be replaced with cross sticks….I used pencils. Loom bar 2 will replace the next stake and the last stake on the right will be replaced with the coil rod. Below you can see how it looks when taken off the warping board. I have just wound a tiny warp and used some random sticks for the sake of this demonstration. Below you can see the loom almost ready for use. What remains to be done is make the heddles and select a suitable shed rod. The yellow and green pencils are holding the cross. Heddles will be made to raise the threads that pass over the yellow pencil and a shed rod will replace the green pencil to raise the other half of the threads. 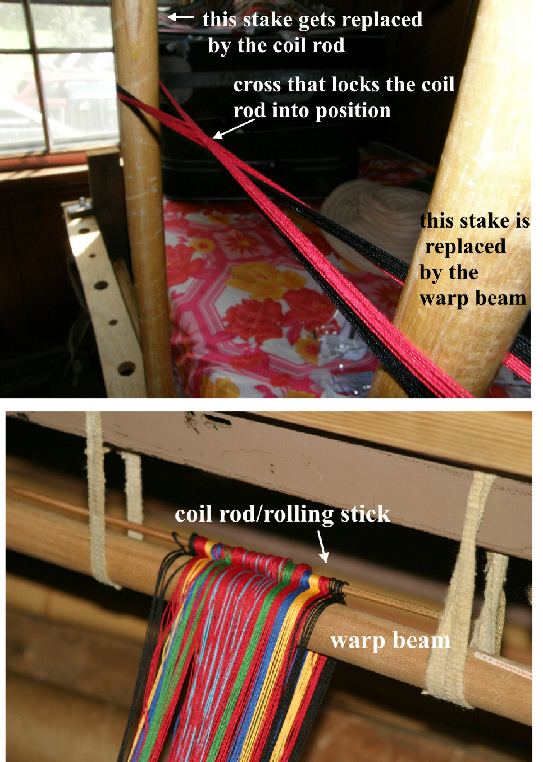 The coil rod has been rolled from its original position, in the picture below left, over the loom bar into its new position as seen below right. This is what it looks like on Ju Nie’s narrow warp. So, I know how to wind a circular warp and put the coil rod into position now…yay. The question remains…what exactly is the purpose of this wee stick? I guess I will find out as I weave my purple scarf. I suppose I will have to weave with a coil rod for a while and then without one in order to note the differences. 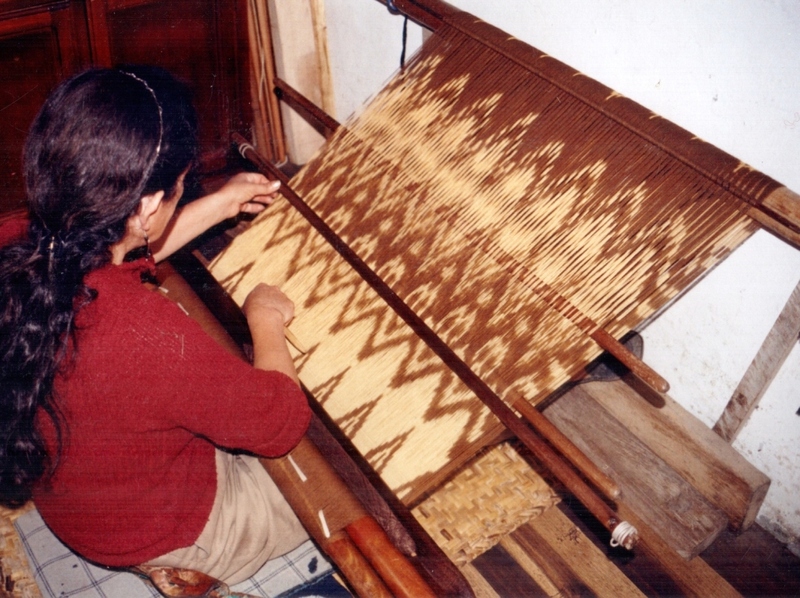 In Weaving and Dyeing in Highland Ecuador, Anne Rowe notes that the coil rod, as used by the ikat weavers in Azuay Province, helps secure the slippery cotton warp and maintain an even width for the fabric. 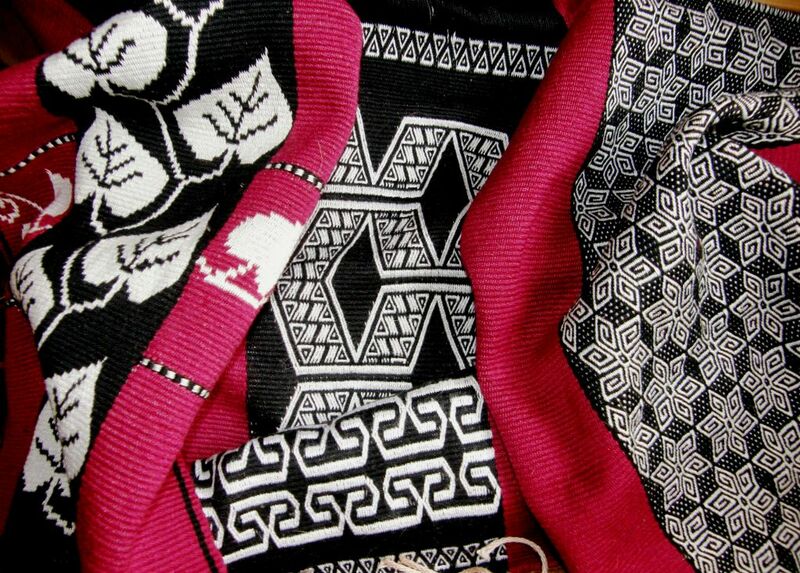 However, it is not used by cotton ikat shawl weavers in Rumipamba. I imagine that the resulting shawls in both areas are equally well made. 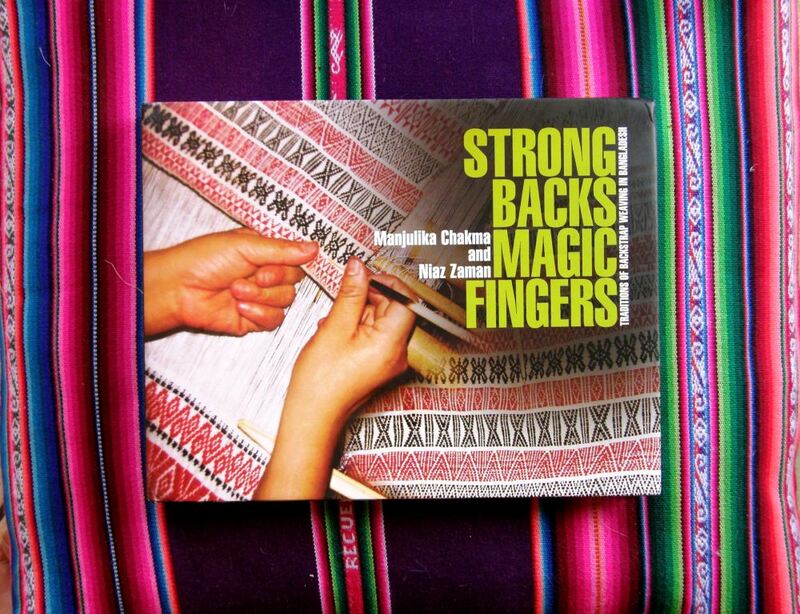 I have a book on backstrap weaving in Bangladesh, Strong Backs Magic Fingers, which describes the looms and textiles woven in twelve areas of that country. While the vast majority of the looms shown have coil rods, some of them don’t. Certainly those that have the finest and silkiest looking thread always do. Yet, some weavers manage happily without them. It appears to be more of an aid than a necessity. Perhaps it is simply tradition that has some weavers using one. I am kind of excited about having this new piece of equipment to experiment with!… a mere stick. In Spiritual Fabric, Sadae Torimaru calls the coil rod that is placed in a body-tensioned loom used to weave narrow bands in China a ”temple stick” and says that it is used to keep yarns and width constant. 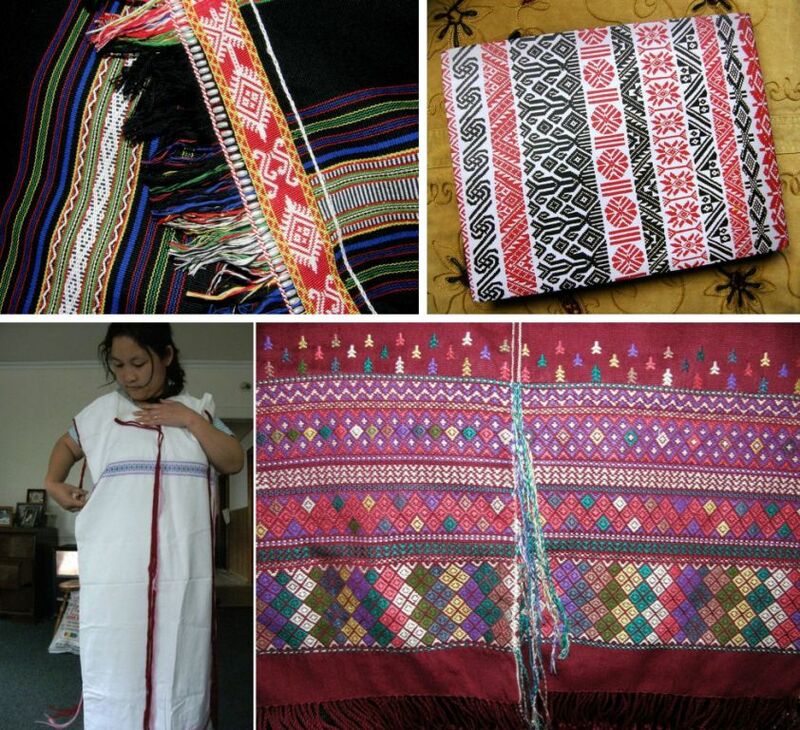 Some of you may like to read Maria Christou’s thesis An Ethnographic Study of the Loom and Weaving of the Sa’dan Toraja of To’barana’. Her research took place on the island of Sulawesi, Indonesia and on page 26 she ponders the coil rod and quotes the thoughts of other researchers on its purpose and use. It would seem that she found the answers to her questons in the course of her one year of study. I have to confess that I haven’t gotten that far in my reading of her paper to know for sure….printing out to read this weekend! If you have made it this far in reading this post, thank you for bearing with me in my ramblings about a stick! 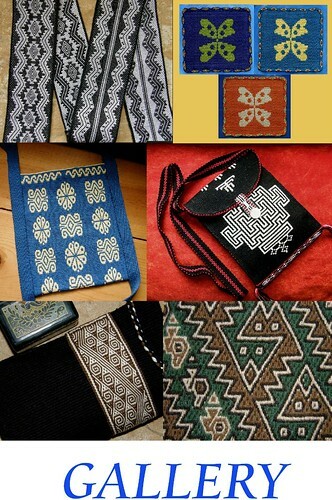 And so, let’s enjoy looking at some of the fruits of these looms we have been talking about. You can see a length of black skirt fabric with warp-float patterns woven by Ju Nie with a weft-twined edge added by her sister. The back cover of the book on weaving in Bangladesh shows the supplementary-weft patterned work of Chakma weavers and Dar Ku shows the white cotton fabric she wove for a dress as well as a richly patterned traditional blouse. And, for those who may be curious about how Ju Nie adds heddles as she winds her warp, here is a video I made explaining it. Ju Nie works way too fast in the video that I took of her doing it! Cool, huh? Maybe one day I will do this. For now, I find it very relaxing sitting at my loom and making my string heddles. There’s always something new to learn! 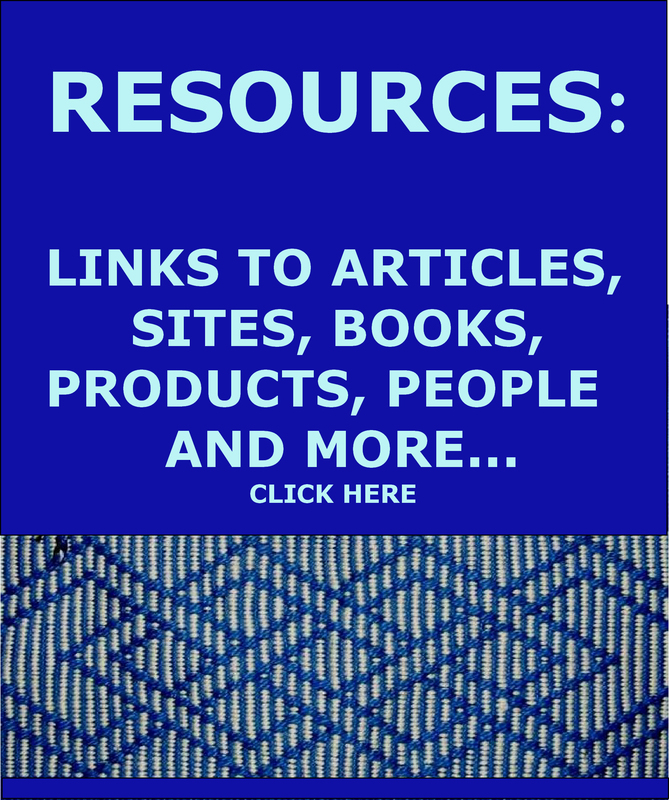 « Backstrap Weaving – New Challenges: Wider, Longer, Finer. Thank you. Great demonstration of heddling as you warp. It is completely fascinating that a “stick” – such a simple and humble item – can be so useful. And that people across the globe figured out its usefulness! This circular warp seems different, however, than the one with the dovetailing. Will this one “open out longer” after you’ve completed the weaving? You are so correct about how calm and peaceful it is to watch Ju Nie weave. Her little toes are involved, spreading wide as she opens a shed, folding prayerfully as she gently beats. Can hardly call it beating, more like gently nudging the weft into place. And watching and listening to you teach on the second video is equally as peaceful and calming. It’s funny your mentioning Dar Ku’s toes. I hadn’t noticed and have just been weaving now thinking about what my toes are doing! Dar Ku would normally be bracing her feet against something as she weaves but she hadn’t gotten around to setting up something that would allow her to do that in her home. So, her feet would normally be very much involved in the process. I think that her feet were remembering the moves! She would probably bring her feet toward her and lean forward to relax tension as she raised the heddles and then push her feet forward hard against her foot brace to increase tension as she beats. Great ! I am enjoying all of your stories and pictures. I have learned a great deal from them. Thank You ! Oops. My apologies for referring to Dar Ku by the wrong name. hello with the coil rod rolling stick when you are weaving how do you advance the warp ? Do you move the hole rod or would you just pull the strings them self around it.? Read the posts that follow this one. I discuss this very thing in detail later. Thanks so much for posting all the information and insights of this beautiful craft. I’ve accumulated a stash of Lace weight handspun yarn that I’ve spun supported. Although I love knitting I’ve been so drawn to backstrap weaving (the regular looms just don’t cut it for me as I’m wanting to venture into weaving). 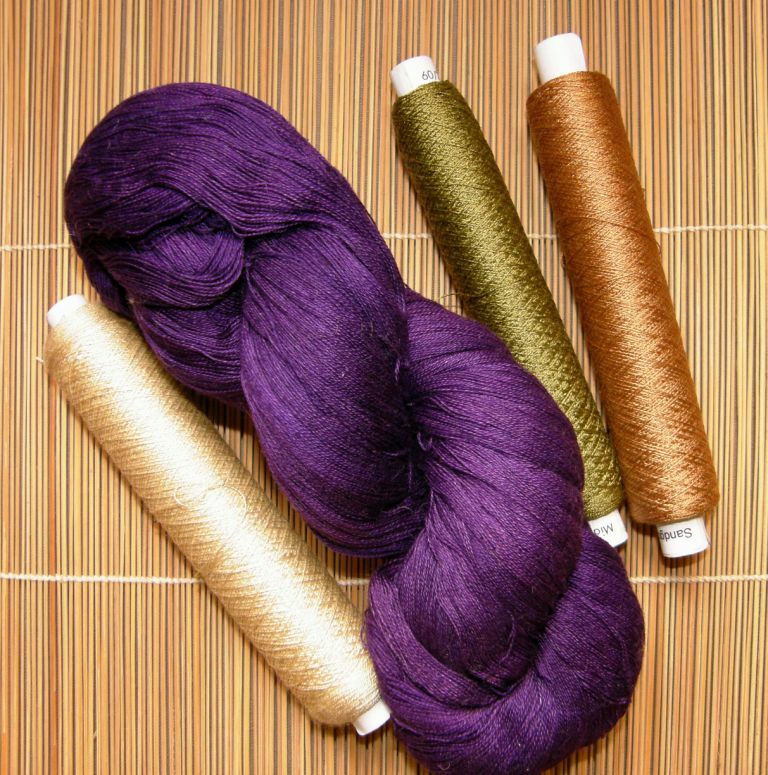 I’ve collected some wooden dowels mercerized cotton thread and ready to set up. But the warping had me baffled. But going thru your posts has really prepared me for a basic loom set up and thru Ravelry the info is amazing. I be doing a two tone scarf with fringes. Fingers crossed and this should go well. 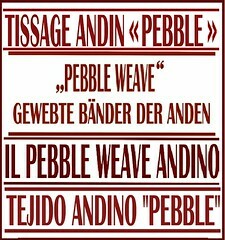 I’ll be following picking up the heddles for a balanced weave scarf. Both mercerized cotton and wool accentuates each other So I’m doing the math for width and length at the moment. Hey Lavernne it’s me again 🙂 I’ve looked everywhere but I can’t seem to figure this out…is there a way to wind a circular warp on a regular warping frame? I have one intended for use with table looms, but now that I’ve switched to the backstrap loom, I’m finding it difficult to use for anything other than single-plane warps. My warping board measure’s out 14 yards and I want to keep the length. I’ve really been wanting to try weaving the way the Katu weavers do, with the loom tensioned with the feet and they use circular warps I don’t have a yard to go outside and plant stakes in to wind a circular warp. Hi Roland. It is supper easy to create a circular warp with the minimum of equipment but not so easy to explain in text. I am going to email you so that you can send me a picture of your warping board and then I will show you how. Tie them together or to their neighbors…where ever or however you feel is most secure.